Nestled in the heart of a dramatic natural amphitheater formed by the Santa Cruz Mountains, Los Gatos serves as the gateway from the Santa Clara Valley to the Pacific Ocean. This happy accident of location allowed historic Los Gatos to witness a colorful parade of swashbuckling explorers, Franciscan padres, and hearty American pioneers, many of whom came to harvest virgin redwood forests from the mountains and grow fruit in exceptionally fertile soil. 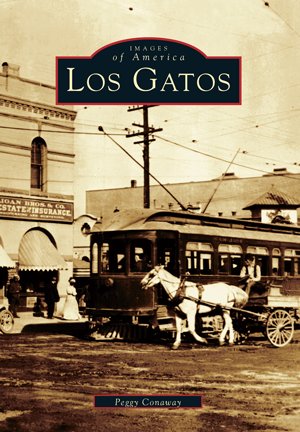 Los Gatos grew up around the 1850s flour mill established by Scotsman James Alexander Forbes. In 1878 the railroad arrived and was a powerful influence for more than 80 years. Named for the mountain lions that still inhabit the area, Los Gatos has reflected the expansive richness of the California Dream for 150 years. In this engaging retrospective, author Peggy Conaway, director of the Los Gatos Public Library, has gathered more than 200 vintage photographs from the library's archives, the Museums of Los Gatos, the California Room at San Jose Public Library, the Sourisseau Academy, and private collections. Her book provides a visual chronicle of the personalities, places, institutions, and events that transformed a rustic village into the charming, prosperous community it is today, home to many of Silicon Valley's high-tech millionaires.